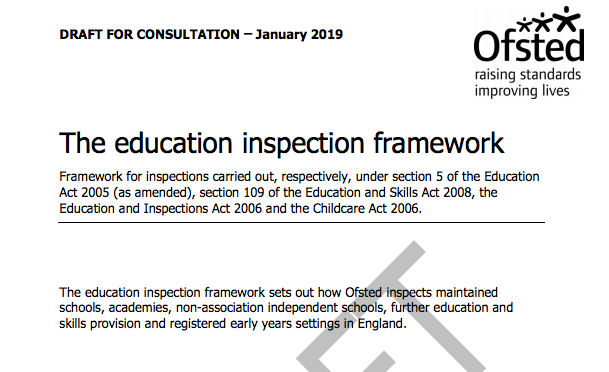 The draft Ofsted Education Inspection Framework (EIF) has been published for consultation, with implementation scheduled for September 2019. It is accompanied by several other documents that offer guidance and clarification. These documents are general in nature, designed to cover primary and secondary sectors and all subject areas. This means it is particularly important for secondary English specialists to question how they will apply to the specifics of their subject area - and to seek reassurance from Ofsted that they will do as much as possible to mitigate against unintended consequences. Here we outline the points that we think need addressing in relation to English. There is much about the draft Ofsted Education Inspection Framework (EIF) that is to be welcomed. Its headline aims address a broad consensus of concerns that exist in English education. We all agree that there is too much teaching to exams and that there needs to be more of a focus on a broad and balanced curriculum; we all agree that teaching has become too data-driven; we all agree that something needs to be done about teacher workload. The EIF itself is a slim document and one that the English and Media Centre welcomes with only one or two small reservations. If schools are left to interpret it on their own terms, we think it will contribute to the development of a much healthier education system – one which will encourage schools to develop their own approaches to curriculum and pedagogy without worrying about whether or not they are teaching ‘the Ofsted way’. Such a system – perhaps ‘culture’ is a better word – would see a mixed economy of approaches emerging that are tolerant of one another, and even borrow from one another, rather than being endlessly confrontational and defensive. For English, this economy would be rooted in the pluralistic practices and kinds of knowledge that exist not only in schools, but also in the academic disciplines of English – Literature, Language and Linguistics, Stylistics, Creative Writing, etc. The EIF, though, does not exist in isolation, but is part of a package of documentation that is bound to have a strong influence on how it is interpreted by schools. Much of this documentation shows distinct biases about what inspectors might be directed to look for when passing judgement on schools. In tone, this is out of step with the light-touch, open-ended EIF itself. Left unchallenged, there is a risk that it will lead some schools to adopt certain practices against their better judgement. Though Ofsted, like us, would like to see a richer, more robust curriculum, some of the documentation seems to offer an inadequate account of ‘richness’ as it would apply to our subject (and presumably others) and even runs counter to some of its values and traditions. The documents in question include the Ofsted Inspection Handbook, the EIF Overview of Research, and various training videos. In their current form, there is a risk that they could lead to new ‘Ofsted myths’ springing up to replace the ones that teachers (and inspectors) have been battling against for years. A primary aim of the new EIF should be that it avoids leading subject specialists to replace the current set of data-driven, assessment-led practices with ones no more valid in terms of the subject itself. In English, we want disciplinary coherence and a clear conception of knowledge for our pupils. With this in mind, the following are the areas that we feel Ofsted needs to address when implementing its new EIF in relation to English. We recognise that the documents currently available cannot be subject-specific, but are writing this in the hope and expectation that separate guidance will be developed for inspectors about English. One of the strengths of English is that it can be studied in so many interesting ways. Ofsted must make room for this – recognising the merits of schools that place high value on, for example, knowledge about language, studying multimodal texts, exploring popular culture alongside canonical texts, etc. Ofsted’s research material splits curriculum into three categories: knowledge-rich, knowledge-engaged and skills-led. This doesn’t seem to be a helpful distinction, given that effective curriculum models need elements of all three. The guidance material is also clearly weighted in favour of a particular construction of the first of these three categories. The distinction may, in fact, lead to an unduly complicated conceptualisation of what a good curriculum should be and make schools unduly anxious about trying to fit what they do into one of the categories (and being particular anxious if they do not subscribe to 'knowledge-rich'). In fact, the attempt to fit the peg into a narrow hole might actually risk the richness of a so-called ‘knowledge-rich’ curriculum. We’re all aware of how new ‘constructions’ can lead schools to skew their thinking to fit a particular model, distorting their curriculum in the process. In this case, an attempt to follow an ‘Ofsted model’ could have the inverse of the desired effect, producing a distortion of the broad and balanced curriculum being advocated. The Ofsted training videos talk a lot about inspections focusing on the ‘what’ of curriculum rather than the ‘how’. But in English the two are inseparable - the ‘how’ in relation to the ‘what’. How a text is studied is just as important as what the text is. In fact, given that the subject is so huge and will always require choices about what to include and omit, the ‘how’ is what provides a coherent thread for pupils progressing from year to year. The texts will vary, but the forms of response will remain generally constant, developing in sophistication. Ofsted’s Overview of Research has a narrow definition of learning, which focuses on a limited body of research that, ironically, is much more about the ‘how’ than the ‘what’ of curriculum, and is thus at odds with Ofsted’s own stated desire to shift the focus to curriculum content. Spaced or distributed practice, massed practice, interleaving, retrieval practice, elaboration, dual coding,cognitive load theory, interesting as they may be, are all derived from the fields of brain science and psychology. These might have a long general history, but they lack a strong research base showing the impact of their direct application in specific classroom settings. This is particularly the case for English, given that most examples are drawn from Maths, Science, or even learning a sport. Applied too rigidly to English, these theories risk limiting textual exploration and personal response. Ofsted needs to recognise different paradigms of learning within the English subject area, and draw on a wider range of evidence bases. At times the theories actively work against some of the subject’s established practices. For example, the Ofsted training material stresses the importance of ‘prior knowledge’. When teaching a literary text, it recommends giving pupils lots of background information about its context before reading begins. This can be a useful approach, but ignores the fact that in many cases such context emerges within texts themselves, and that coming across information in this way is integral to the reading process itself. We are already hearing of some pupils being told what a novel or play is about in its entirety before reading, as a consequence of misunderstanding what is meant by ‘prior knowledge’. We don’t want a situation where this becomes the norm because of a lack of complexity in Ofsted guidance. The omission of any mention of subject disciplinary research (and subject-related educational research) is of equal concern. At secondary level, much of the most valuable research for teachers of English seems to be that going on within the subject itself. Teachers who are up-to-date with current research about knowledge and practices in their own subject will be well placed to share that knowledge with their pupils. Clearly the material published so far cannot go into the specifics of individual subjects. However, it could recognise the care that needs to be taken when deciding whether or not a particular learning theory is suitable within a particular discipline. The Ofsted documents place a strong, and in our view disproportionate, emphasis on the importance of vocabulary teaching. While there is clearly some correlation between vocabulary size and attainment, as with other aspects of language development, Ofsted needs to be clear that vocabulary development itself can only occur within the context of rich study within the subject as a whole – in particular wider reading and rich classroom talk. The explicit teaching of vocabulary is of some use in developing pupils’ language ability. However, what can be achieved by this is relatively limited and of almost no value if further language study is neglected as a consequence. The most up-to-date research, from EEF and others, including significant meta-studies not referenced in the Ofsted research document, acknowledge this. Inspectors need to be made fully aware of this so that they recognise when engagement with vocabulary is of genuine benefit to pupils. ‘Cultural capital’ is defined in the handbook as referring to the learning contained in the National Curriculum programmes of study. If that is the case, then why use the term at all, particularly as it is a difficult concept that is tricky to pin down, often used glibly and without exploration of its full implications? It belongs primarily to the field of sociology and the principles behind it do not transfer simply across to school learning. Its inclusion in the EIF and guidance materials risks making English teachers feel obliged to focus on texts of a particular kind, and to stay clear of others, even though they would offer rich learning experiences. Inspectors should also recognise that English study, within the academic discipline, often involves questioning what culture is, which texts are ascribed high value and why, for example. This process needs disentangling from any concepts of cultural capital that remain in the guidance materials. The documents make positive comments about the value of reading for pleasure, which are to be welcomed. However, care needs to be taken when recommending that pupils need to read material at or above their chronological age. Clearly this is desirable in the classroom on almost all occasions. However, Ofsted needs to recognise an established link between reading for pleasure and attainment that does not consider the level of reading, or at least presents a complex picture. The guidance materials need to take care not to lead schools to place excessive limits on reading material outside the classroom, and so risk putting pupils off reading. At the moment, some of the guidance material reads as if only challenging reading material will be looked on favourably by inspectors. Young readers do need to be challenged - but they also have a right to feel comfortable in their personal reading choices so that they can genuinely read for pleasure. The documents recognise the value of classroom talk, which is to be welcomed. However, they include lots of qualifications about how speaking and listening activities need to be tightly structured and formalised. This is not always the case in English, and so it is very important that Ofsted inspectors are clear about the difference between talk as ‘oracy’ and ‘talk for learning’. The first is about helping pupils to speak and listen well in multiple contexts – everything from formal presentations to informal dialogue, from individual speeches, to group discussions. By contrast, with ‘talk for learning’, the focus is less on improving talk and more on how dialogic approaches support learning in the subject. At secondary level this is talk for subject learning, first and foremost. The qualifications about structuring classroom talk are unhelpful unless this distinction is fully understood. The above points will presumably apply to some extent to other subject disciplines too, but our concern here is exclusively with English. We already operate in a system where form in English is excessively valued over content (see Myra Barrs’ comments towards the end of this excellent Guardian article about English). This means that pupils are often being rewarded for performing to an examination-focused idea of what English looks like, rather than for the quality of their ideas and thinking. This problem won’t go away if English teachers feel pressured into conforming to the rather narrow notion of learning contained in some parts of the EIF documentation. We will simply see one set of performances replaced by another. This needn’t be the case, though. But it does need Ofsted to act firmly and clearly to identify the broad range of practices that are possible in an English curriculum. And it requires a recognition that a national regulatory body has a responsibility to acknowledge the validity of multiple approaches to curriculum and learning within specific subject disciplines.